The information submitted by Belarus to the European Higher Education Area in 2018: Bologna Process Implementation Report is largely misconstrued, showing need for a monitoring implementation procedure – similar to Advisory Group on Support for the Belarus Roadmap (AG2) and active participation of civil society. The message from the Belarusian Independent Bologna Committee (BIBC) and Eastern Partnership Civil Society Forum (EaP CSF) Belarusian National Platform Ad Hoc Committee is clear: Belarus is still in need of a special Bologna Follow-Up Group (BFUG) assistance – we read in a memo addressed to BFUG, ahead of its planned meeting on 27 September 2018. The concern is that the mandate of AG2 is now over, after presenting its progress report at 2018 European Higher Education Area (EHEA) Ministerial Conference, held on 24-25 May 2018 in Paris. The signs, coming from both 2018 EHEA Implementation and AG2 final report, are worrying and present ample evidence that Belarus is still a long way away from implementing its Roadmap for Higher Education Reform. Given the input presented by the Belarusian authorities, as well as limited progress on the ground, this is a task that is proving to be increasingly more difficult for the country to confront on its own. This “distorted assessment” serves no purpose, claim the authors of BFUG memo. 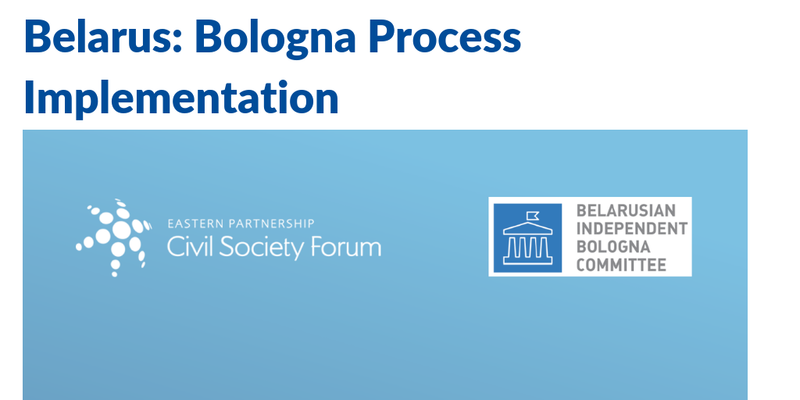 It is neither useful nor effective strategy in addressing the challenges put by the Bologna Process. “It is difficult to assess whether it has been done on purpose or it is a result of incompetence”, we read. What comes across is the need for a special monitoring procedure and further engagement with civil society, which guarantee the successful integration of Belarus into the EHEA.